Read was undoubtedly correct that it was independently produced around 1878, by a highly-skilled craftsman. 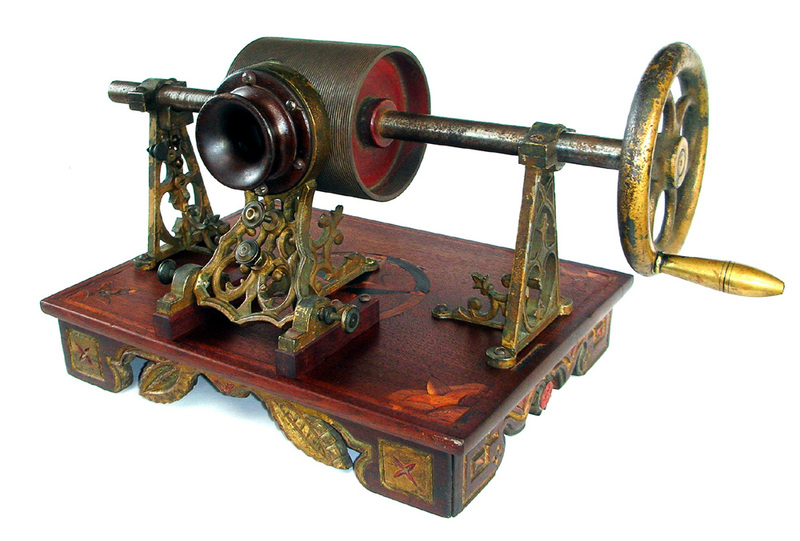 It is vastly more artistic than any other tinfoil phonograph known, with an elaborately hand-carved 13" by 10" mahogany base with complex inlaid designs, and gilt and painted highlights. A small hidden drawer on the rear of the base held tools and spare stylii. The filigreed metalwork is made of gilded cast iron, which suggests that others others were made at the same time. (Complex castings like these are very difficult and expensive to make, so machinists would normally amortize the cost of creating patterns by producing multiple castings.) However no others are known to survive today. It is not only artistically crafted, it is technically advanced as well. In addition to the adjusting screw on the speaker casting to control the depth of the stylus, there was a locking mechanism to hold the speaker in place. 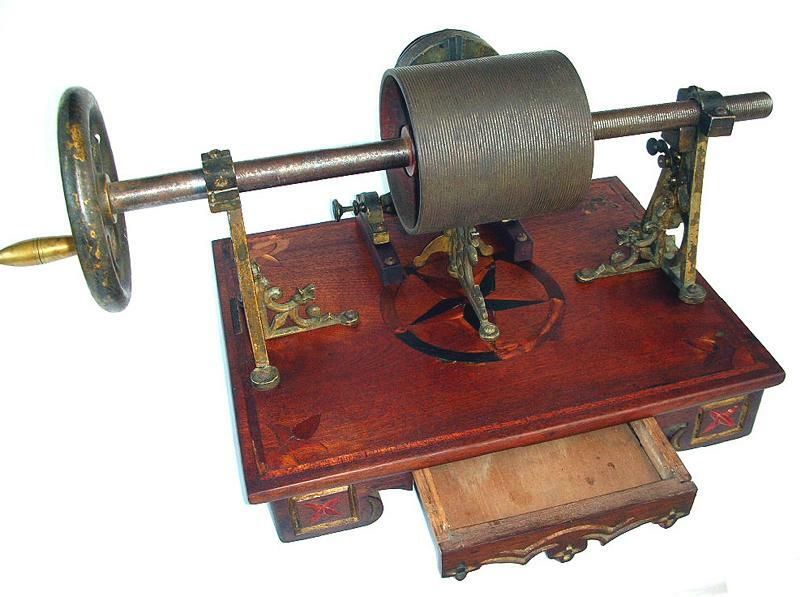 The only other tinfoil phonographs with this feature were the exhibition machines made by Sigmund Bergmann in mid-1878. It also has a cleverly designed throwout switch on the left support to disengage the feedscrew for rapid repositioning of the mandrel, another Bergmann innovation. Overall, it is a very well-made and sophisticated piece of work, clearly not an amateur job. Whoever the original artisan was, this is unquestionably the most beautiful and ornate tinfoil phonograph in existence today. The only phonograph that could rival it for complex workmanship is the magnificent "St. Clair" craftsman-made phonograph in the collections of the Henry Ford Museum. 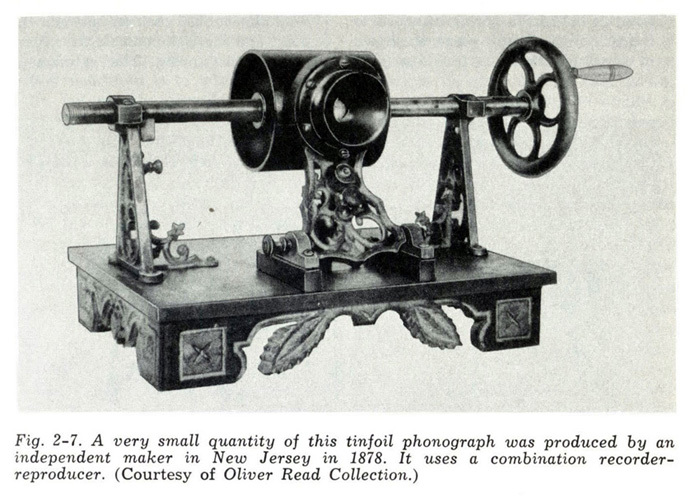 This tinfoil phonograph appeared in the 1959 edition of the classic book "From Tinfoil to Stereo" by Oliver Read and Walter Welch, as seen in the scan above. 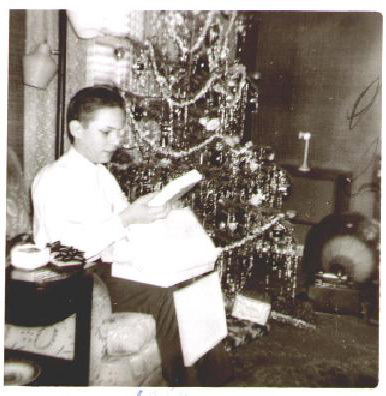 On Christmas morning 1962 my parents gave me a copy, which I still have today. I read and re-read that book more times than I could count. (For many years it was the only reference available to collectors.) I can still vividly remember seeing this tinfoil for the first time that holiday, and being mesmerized. I never could have imagined that 45 years later this very machine would end up in my own collection! It seems all the more surprising given that until I acquired it, this exquisite phonograph had changed hands only once in 75 years.